Thick, rich, and hearty, this vegetarian soup is the perfect comforting end to a cool day. 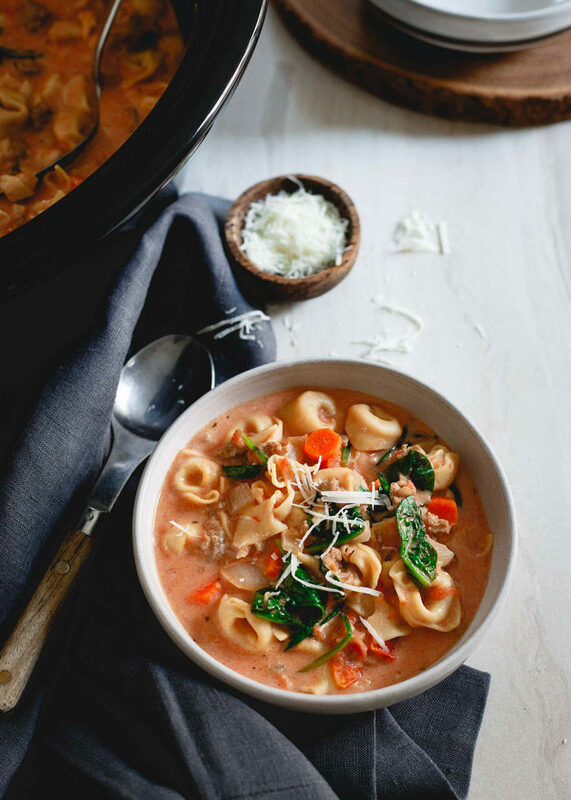 Tortellini, spinach, tomatoes, and cheese – what could go wrong?! Just add sausage for the meat-eaters. 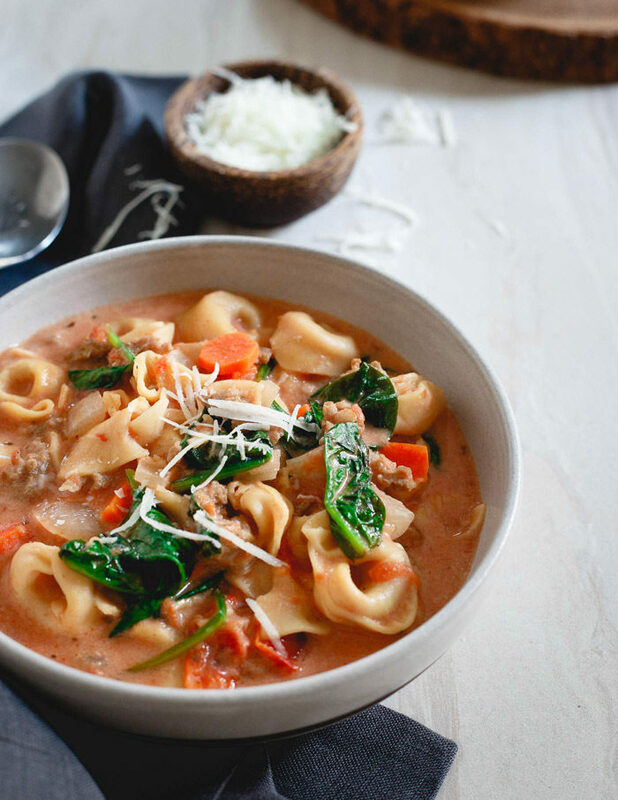 Note from Kare: Gina from Running to the Kitchen is here today sharing her oh-so comforting recipe for this creamy slow cooker tortellini soup. It’s cozy, hearty, and – maybe most important – EASY! I know chicken noodle is supposed to be the token “feel better soup,” but I honestly can’t think of a single time my mom made that in our house, sick or not. No hard feelings on that one as it’s actually one of my least favorites. Sick food was always a big bowl of tortellini in broth, lots of cheese and a sprinkling of parsley. It was perfection. 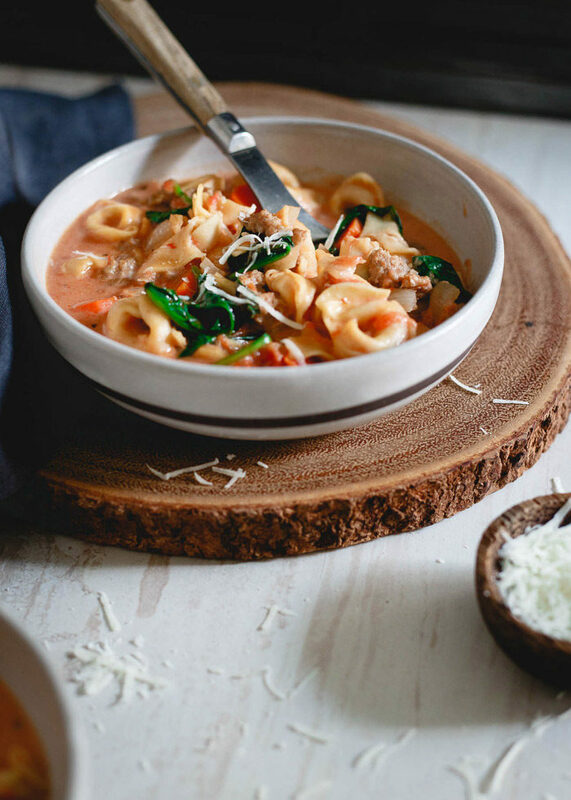 The savory broth with the cheese from the tortellini and extra parmesan on top along with the perfect bite of freshness from the parsley was happily slurped down by us all. To this day, even at 34, I want nothing else when I start to feel under the weather. It’s because of that soup that I have a soft spot for tortellini. Those little pasta bundles filled with cheese are pure comfort food to me and it’s hard to pass up any recipe with them. 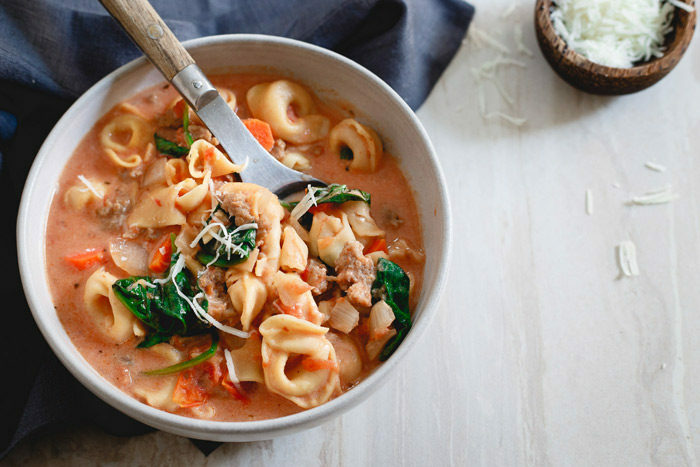 As we get into the colder weather and soups start to make more frequent appearances on the dinner table, this creamy tortellini soup with tomatoes, spinach and a meat-lovers option of sweet Italian sausage is the perfect way to easily feed the family and keep things simple, hearty and comforting. The slow cooker does all the work in this one! All the better when you’re under the weather. Add the carrots, onion, garlic, spices, tomatoes and broth to the slow cooker. Cover and cook on low until the carrots are tender, 3-6 hours (time varies depending on your slow cooker. If you cook it for longer – say, 8 hours – it won’t hurt). 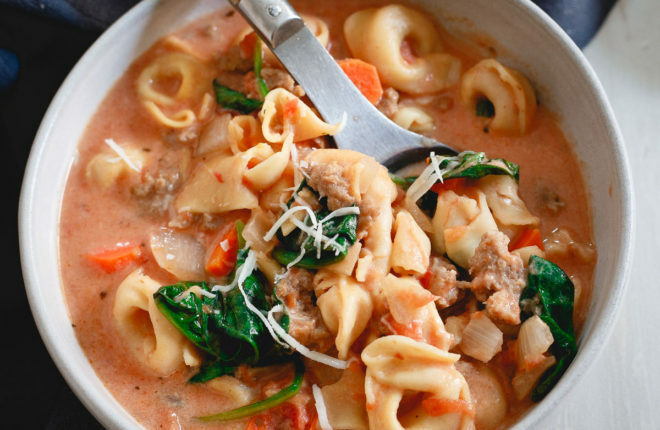 Add the tortellini to the slow cooker, stir to combine, cover, and cook on high 20 minutes. Add the spinach, stir until wilted, cover again, and cook another 5 minutes. Warm the half and half in the microwave for 30 seconds. Add the cream, mozzarella, and Parmesan to the slow cooker. Stir until thoroughly combined and turn off the heat. Remove bay leaf. Season with additional salt and pepper to taste. If adding sausage, place a large skillet over medium-high heat. Once hot, add sausage to the pan and brown, breaking into small pieces with a spatula or wooden spoon as it cooks. Add cooked sausage to individual servings. Add cooked Italian sweet sausage to individual portions. All images and text ©Gina for Kitchen Treaty. Gina writes the blog Running to the Kitchen, a healthy, seasonal, and whole-food focused site. She likes dabbling in all the dietary niches (it's a fun challenge!) although she eats pretty much everything under the sun - except passion fruit, it smells like feet and grosses her out. 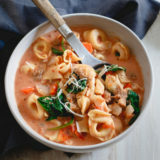 What are your thoughts on freezing this soup in individual portions…would the half and half and pasta do “strange” things when thawed ?? This was sooo good! We will be making it often! Can you use coconut milk or cream instead of half and half or heavy cream? I can have cheese just not the cream. Hi Renee, I’m not sure I’d recommend coconut milk because of its sweetness, but cashew cream would work perfectly if you don’t mind whipping some up! , I do not know anything about cashew cream. I live in Kelowna BC Canada so i don’t have access to the same items that are available in the USA. Happy Thanksgiving. i had assumed ahead of time what to get for this because i forgot the recipe at home and grabbed frozen tortellini can i use that? Next Post » Welcome to the New & Improved Kitchen Treaty!